the ASK: It took me awhile to make sense of “reading days.” I know it sounds ridiculous, but I struggled to find the sweet spot between “teacher work day” (which I knew it wasn’t) and “stations” or “mini-lessons” (which I also knew it wasn’t). Ultimately, I didn’t have a good way to find out HOW students were reading, which meant I didn’t know how to teach on those days. the TRY: My solution was a pretty simple one: ask them. And along the way, teach students more self-assessment skills. Now, on reading days, students self-select where they want to be in the room and thus, self-select the kind of instruction they’ll get. The ones who need a quiet place to read get just that. These are often the readers who feel encumbered by too much “stop and go” and find their “reading flow” through the gift of time and trust. The students who want to conference understand that at some point in the class period, I’ll ask them to pause and we can talk. Sometimes they have questions, sometimes they want to work out an idea. Other times, they want reassurance they’re paying attention to details that will help them formulate their own ideas later. Some students are stuck. These students are often ones who have missed class recently or feel paralyzed by being so far behind. I always start here and try to quickly assess why they feel stuck. Once I understand, we can modify a reading schedule, create better background knowledge, move them to another part of the room or even modify the reading if necessary. I am very transparent about a “no judgment, just be honest” approach to these conversations. 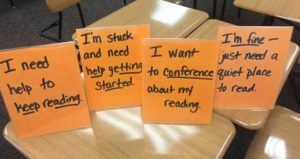 Other students struggle with stamina and need help to keep reading. I usually put these students in smaller pairs or triads. I often ask them to get out the timer on their devices and set it for 5 minutes. The pair will agree to focus on the reading for 5 minutes, then pause to summarize to their partner. They set the timer again and keep reading ⇢checking in, reading ⇢checking in throughout the class period. I encourage them to lengthen the reading time, but would rather have them stay in the shorter increments than stop entirely. the LEARN: More than anything, this approach to reading days has taught me the necessity of withholding judgment if we really want students to keep reading. A lot of these kids would either shut down or fake their way through the most essential skill of our classroom if I created any kind of punitive approach to these days. Reading days aren’t graded and I don’t associate points with them at all. It’s all goals, reflection and forward motion. Love this strategy! Thank you for sharing. Great model to try with the teachers I coach — Ask, Try, Learn. I’m going to explicitly add reflection as well (which is what you always do!). Thanks for always being a lead learner and for sharing the entire journey, not just the successes. Love your honesty & transparency. I love those prompts — Ask, Try, Learn! I truly appreciate your kind words. It’s such a gift to do this work. I love this idea!! I’m wondering how you set up the classroom to fit the needs of students each period.